You have to credit Coach John Palowski. After the disappointing performance against Arizona State, almost 2 weeks ago, Auburn has rebounded nicely, reeling off 7 straight wins. The Tigers sit alone on top the SEC West and have a huge amount of momentum going into this weekend's SEC Home Opener against Carolina. It's hard to tell right now if these wins are solely from Auburn being improved, or from the competition being sub-par. Still, even if you discount Alabama A&M, Samford, and a very down Georgia team (which lost to Furman last night), Wednesday night's Max Capital City Classic showed, to me at least, that those wins weren't flukes. Don't get me wrong, Auburn played a far from perfect game Wednesday. 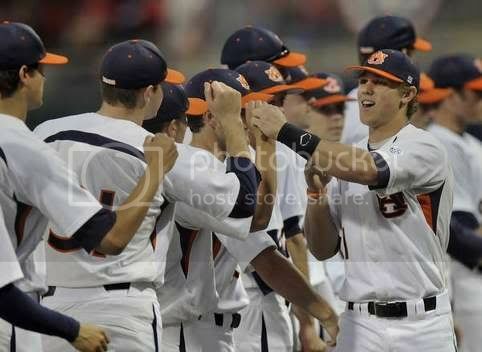 A couple of base running mistakes, a shaky start from an Auburn starter, and some fielding errors made the game close. Despite all this, Auburn managed to take down one of the nation's best teams (for a game at least). I only got to catch the second half of the Capital City Classic in person, and even then I wasn't entirely focused on the game. From what I can tell, and read, Slade Smith's start was an aberration. He wasn't totally effective, but he wasn't a total wash either. It seemed like he just feel victim to an umpire with a tight (and inconsistent) strike zone. That caused his pitch count to soar (to the 70s) and his confidence to be rattled a bit. As a learning experience this has to be tremendous for Slade. Last night was only his second start and just his third appearance on the season. I think at this point it's safe to say he's locked down a permanent midweek role. At least, I'd hope he would. In all honesty, the midweek games are going to be few and far between. Outside of the Georgia State/South Alabama double dip to begin April, Auburn will only have one midweek game each week to test Dexter Price and Slade Smith. Coach John Palowski will have to figure out a way to use them, especially with Cole Nelson and Cory Luckie locking down the Friday and Saturday starters roles. One thing is certain, from what I've seen from Smith, Luckie, Price and others, I'm not worried about our starting pitching in 2011. Even if Cole Nelson is one and done, Auburn will go into next season with a ton of seasoned arms and newcomers to aide in relief. Pitching has transformed from a weakness to a strength in little over a week. All of this praise is tempered a bit. The real test will be this weekend. If Auburn can get through Carolina and we don't have a bullpen collapse or a rough outing from a starter, then the chances of getting back to Hoover are almost assured. I've written at length about the pitching, but there's one thing I haven't talked about. As the season goes on, the pitching should improve even more. CJP seems to have a good idea of what he has and how he plans on using them. For example, Austin Hubbard. It seems CJP has complete confidence in him (as you should in your closer). I thought for his last two outings that we might be bringing Austin in a little early (6th inning against UGA/8th against Bama). Yet, Hubs responded in shut down fashion. He's walked a tight rope a couple of times sure, but his confidence is growing and he's getting more and more effective with his slider (his best pitch). Our bullpen has come onto its own lately. Sean "The Secret Weapon" Ray gets better with every appearance; Brad Hendrix has calmed down tremendously; Mike Hurst (MVP of the Cap City Classic) is finding a nice role; Zach "Bulldog" Blatt seems be in line as a future closer; and more. It seems that little by little each guy has a set role, each guy is buying in to that role, and in the long run, it just makes Auburn better. 5 P Primer is coming up Friday. Regional Radar later today. Official recaps of the Samford and Alabama games are linked here and here. Photo via.